Councilmember Scott Sherman also lead the Ride of Inspiration in 2014. Photo courtesy Jeff Powell. Councilmember Scott Sherman will lead this year’s ‘Ride of Inspiration,’ a charity motorcycle event and community festival that supports individuals with Down syndrome and their families. 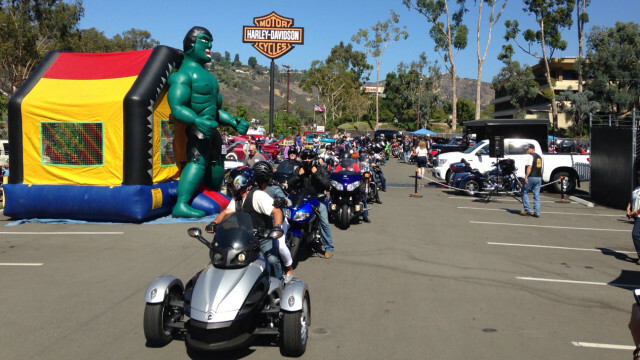 DS Action, a non-profit organization that focuses on helping people with Down syndrome, planned the event located by the San Diego Harley-Davidson motorcycle business on 4645 Morena Blvd. Admission to the general public is free of charge. Registration begins at 9 a.m. and the official motorcycle ride kicks off at 10:30 a.m. and ends at 3 p.m. on Saturday. For the third year in a row, Sherman will kick off the event to raise money for the Down syndrome Center at Rady Children’s Hospital, according to DS Action. Hundreds of riders are expected to participate in the event, according to DS Action. In the afternoon at 12 p.m., there will also be carnival games, raffles, vendors, food, prizes and music from the popular jazz artist Jose Molina Serrano. According to the event’s Facebook page, the community festival will include a Motorcycle Poker Ride, a Car Show and a Poker Walk. There will be prizes for the high and low poker hands, the winner of Best in Show, the Kid’s Choice award and the Most Represented Club. The charity efforts made by DS Action and Rady Children’s Hospital are a huge support to families and individuals with Down syndrome.